According to Fortune.com the bottled water industry in America is worth almost ten billion dollars a year in sales. Corpwatch.org says that the world market is worth 50 billion a year. 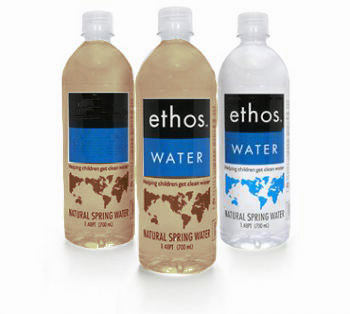 Before its Ethos Water campaign Starbucks annual sales from bottled water sales is 25 million. When I do the math that breaks down to a 2.5% percent share of the American market and a .05% share of the World market. With the industry growing every year, Starbucks is cashing in on our need for designer water to fit our consumer lifestyle by making it convenient to help a needy cause. Unfortunately this comes at a higher price. When I went to Starbucks the other day I bought a bottle of water for a $1.24, including tax, bottled/recycle law cost, etc. The cost Starbucks is planning to charge is much higher, a $1.80 for a 700 ml unit. Starbucks is committed to donating $10 million dollars to make water cleaner in different portions of the world. But for this to happen millions, in sales and units will have to be purchased. Look at the following equations. That's a lot of bottles of water but if anyone can do it Starbucks can. It's a shame that such a small portion of their profits will be donated to charity, only 2 percent of the entire cost of the water unit. It also means that Starbucks will have to sell 40 million worth of water a year representing a 160 percent jump in their current sales to make their goal. It's a great ploy by corporate America to increase their sales. Here's an image that breaks it down. The image on the right represents all that is good about charitable donations. You take a company name and combine it with the pure, clear water it is the non-profit charity organizations that help the underprivileged. The image on the left represents the international corporation that has given into capitalism, the muddy water representing the bottom line, the dollar at work. The image in the middle combines the two, it gives the corporation a name and brands itself defiant saying "I am helping others but I am going to make big profits while doing so."